You might be an honest and law-abiding citizen, but would you fudge the truth if it meant sparing someone you love from losing their job or going to jail? 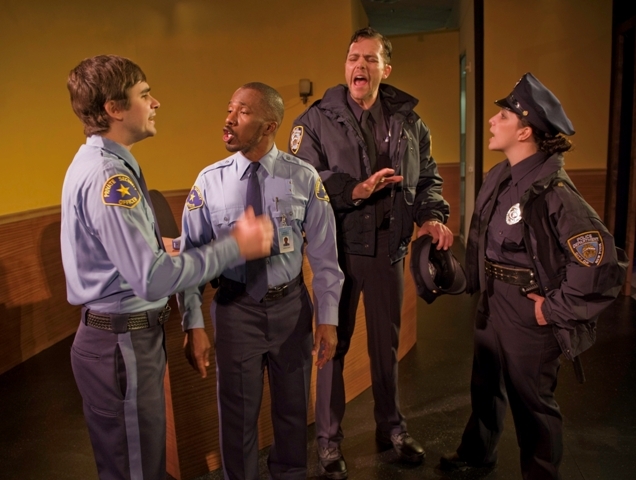 Kenneth Lonergans’ “Lobby Hero” – onstage through March 21 at Pacific Stages in El Segundo – explores not one moral dilemma but several in this taut, well-crafted, four-person drama that takes place in the lobby of a high-rise apartment in New York City. Breathing life into this tale that delves into concepts of self-perception, integrity, and the consequence of our actions is a fine cast directed by Robert Bailey. Jeff, played by Edward Tournier, is a recently-hired security guard who works the late shift. He’s been described as a slacker, someone who hasn’t found himself. On the other hand, he’s easygoing and chatty and tends to say whatever comes to mind. I noticed that the paperback he’s been reading is Franny and Zooey, and if you think about the author of that book, and what else he’s written, you’ll gain even more insight into Jeff’s character. The young man’s supervisor is an African-American named William (Kareem Ferguson) who has succeeded in pulling himself up by his bootstraps. If his bearing seems ramrod straight, keep in mind that it’s an extension of his aspirations and character. Jeff’s simplicity and lack of airs encourages William to open up a little. Another subject that “Lobby Hero” brushes against is how and why we confide in others; it is also, perhaps, about what happens when that confidence is betrayed, whether by accident or for personal gain or for revenge. Meanwhile, two officers, Bill (Nick Mennell) and Dawn, his rookie partner (Dana Lynn Bennett), stop in at the high-rise. While Dawn waits downstairs, Bill goes up. The dynamics between the two police officers can be compared to that between William and Jeff. Where they begin to cross over – for clearly the uniform does not the person make – is when Jeff tells Dawn that Bill is having an affair, not simply visiting an old buddy. The young woman is shaken up, not only because Bill has been something of a mentor and role model, but because he has already made sexual advances to her and she has fallen for them, fallen for the sense of power he exudes and his bogus charm. The consequences of Jeff’s aside to Dawn are immediate: Bill is furious and all but threatens Jeff for what he’d told Dawn about him – she spilled the beans instead of keeping Jeff’s words confidential. Mennell is very good at portraying a menacing, intimidating cop. When Bill launches into him, Jeff freezes up. If you’re sitting in the first couple of rows you’ll freeze up too. Now, I don’t want “Lobby Hero” to sound like a grueling and oppressive night out. It’s anything but that! One of the beauties of the play, besides its nuanced and balanced dialogue, is that the intensity of one scene is often counterbalanced by dry wit and humor. There are many funny moments that make the viewer laugh and smile, and they often emerge when we least expect them. Eventually, all four characters are entangled in the same web, but one key aspect concerns how each of them sees him- or herself with regard to family or upbringing. Jeff continually cites his father, a Navy man, with whom he had a love-hate relationship. Dawn often mentions her parents, William his brother, and Bill the tightly-woven clique of his fellow (male) officers. My guess is that it’s no coincidence that the two most similar – and yet dissimilar – characters are named William and Bill. Probably both of them are or were called William and Bill, but Bill is more informal, and less stiff, while William might be what a Bill would call himself if he wanted to be taken more seriously. The issues this play examines are never quite black and white, and in fact the canvas is simply an array of gray shadings. Jeryll Adler and Pacific Stages have delivered everything they’ve been promising, giving the South Bay a thought-provoking work of substance, solidly written, well-acted (Tournier in particular makes a tough assignment look easy), and riveting. They didn’t go for a known quantity with their first offering, but they could hardly have made a better choice with which to announce their arrival. This is a class act.